While many action/adventure games focus their attention on equipping players with fantastical weapons to take down formidable foes, sometimes designers try to think outside the box to empower their audience with all-new ways of advancing the experience. That appears to be the case with Lyon-based Redlock Studio, an innovative indie team which is leaning on platforming, puzzles and the concept of language to communicate a compelling story in Shattered: Tale of the Forgotten King. Of course, the game features high-quality visuals, innovative camera mechanics and solid RPG crafting elements as well, which is likely why Redlock Studio is generating significant buzz and, well, shattering expectations for the studio’s first official project.. I recently caught up with Creative Director Maxime Beisser Rene and Writer Laureline Denis-Venuat of Redlock Studio to get some insight into the project, its unique language mechanics and how Unreal Engine 4 has helped empower the team to fulfill its creative vision. Q: Shattered: Tale of the Forgotten King looks like an amazing project. How did it come about? Laureline: To begin with, thanks a lot for your interest! Shattered has actually been in concept for quite some time. Its universe came up progressively throughout several role playing campaigns that Max, the director of the project, invented and animated. Seeing those stories turned into a proper video game was like a childhood dream. So, he built up a team to make it all come true and we shaped this dark and poetic world until it was possible to evolve in it as a player. Q: From The Wanderer to The Whisperer, there are several unique characters to encounter throughout the game. What can you tell us about them and their role in the story of Shattered? Laureline: Characters in Shattered act and exist on different levels, from mortal to divine. They are the living manifestations of the trauma inflicted on the world of Hypnos. Each have their own truths, their ideas on the world and existence, and present the different reactions that we can imagine around an apocalyptic scenario. They allow us to cover extremely different points of view from a narrative perspective and bring a lot of depth to the overall experience. The same character can be an ally, an information source, or act in an apathetic or hostile way, depending on where you find them in the game because most of them are constantly forced to fight for survival in order to avoid becoming part of the "Fallen", the Demiurges' goons. The main ones we can talk about are Y'aak, the Whisperer who guides us from the start, The Geodesian, a wise being whose thoughts and studies we can see in the scattered pages of his journal and finally, the Spectre, or the recurring echo of an ancient legendary warrior. 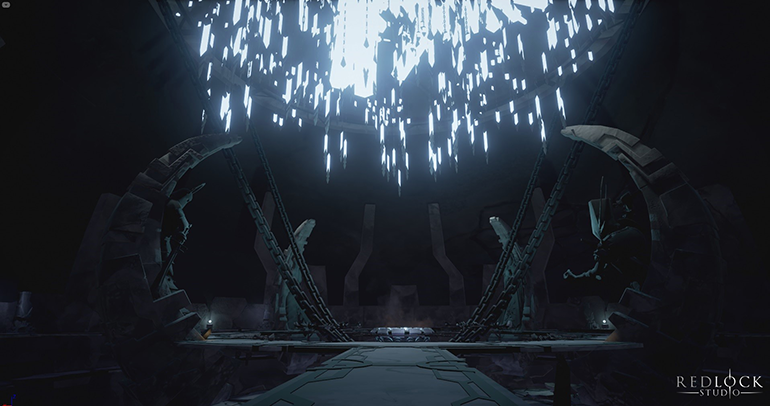 Q: Shattered features 2.5D environments for the player to explore as they solve a combination of small and large puzzles. What can you tell us about the types of puzzles the player will encounter? Laureline: Puzzles are mainly presented via interactions with the environment such as levers and gears to activate with visual and auditory riddles to solve throughout the level to move forward, unlock doors and translate ancient texts. NPCs also contribute to them, by giving away missing elements for services or limbo essence. Q: While the level exploration takes place via a 2.5D perspective, the boss battles shift the player into a 3D encounter. Please explain the team’s decision to pursue this unique approach and describe what it brings to the experience. Laureline: We were torn between our love for the traditional platforming perspective and the way that a free angle camera in third person can express the gigantic and epic aspect of going against titans or gods. This transition also helped us to shift the player's perspective, by involving them emotionally - especially with those camera angle changes. With it, we could also vary the rhythm of the game and surprise the player, all the while giving them the ability to play between those planes. Q: Players can develop their skills throughout the adventure. What can you tell us about the character progression mechanics in Shattered? Max: The character progression works via a character sheet. The statistics will evolve seamlessly during the adventure as the player customizes and levels the Wanderer through the Limbo Crucible. 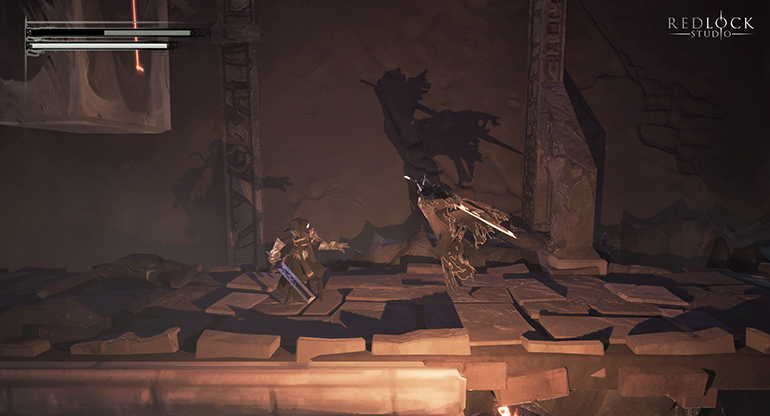 Throughout the game, the player will discover several cardinal nexus, tied to the key forces of Shattered's universe, that will unlock potions to apply onto the Wanderer's armor, mask and sword in the Crucible. Another character progression mechanic is through the glyphs that you receive after the death of each of the 12 Démiurges. 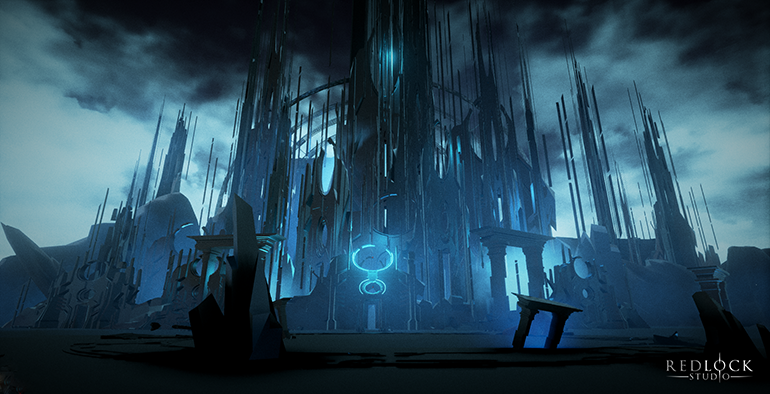 The nature of the glyph depends on how that particular boss was beaten, but we won't reveal more just yet. Q: What can you tell us about the crafting system in Shattered? Max: Originally, the crafting system allowed the player to create several weapons and armor, which would be the main ways to customize the character. In order to focus on an efficient system rather than wasting too many visual resources though, we ended up going for a system of expendable items to use on the main equipment which in turn evolves depending on which glyphs are retrieved. There are about 150 different combinations to craft and equip in-game, which provides as much customization as possible. 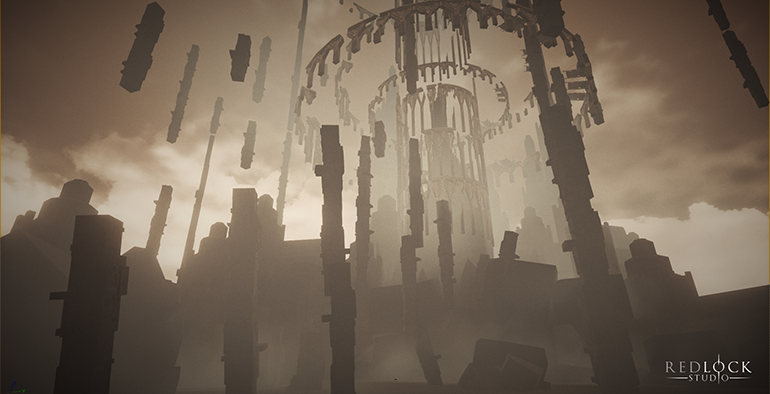 Crafting is an essential element in Shattered, and heavily involved in the main storyline. If used correctly, it can allow the player to get to the game's ultimate ending. Q: Speaking of which, as I understand it, the game’s ending is reliant on the player’s ability to decipher it based on the language translation level they can achieve. Please explain this interesting mechanic. Max: In Shattered, aside from the Whisperer, no one can actually speak. Speech is therefore essential, a source of power and influence. In addition, the Demiurges seem to have their own language that no one except for Y'aak can translate. However, this ability is within the Wanderer's reach if he can retrieve the lost fragments of this knowledge. This all comes together during exploration and puzzle phases, but it can also unfold a new layer to the story and quickly reveal an essential element: Truth is subjective, and myths are often born from misunderstandings, futile events or terrible lies. We had to try several systems, starting from scratch each time, always trying to go beyond our prejudices while accepting our inspirations. Ironically, this actually demonstrates the underlying story - it's like compiling and transcribing an original idea that naturally changes shape to become something very far from what it originally was. We are all still relatively young and researching what works best, but what we want the player to experience has been anchored in us for a long time. While Shattered's visual style is an area solidified as we feel it perfectly compliments the gameplay and narration, we still have two years of development left on gameplay systems and we know we will refine them before release. Q: How big is the team that is working on the game? Max: We were four to start with, then a dozen. The team was 23 people strong during the production rush this summer, but we are now a stable team of 14 people. Max: UE4 is the engine that matches our expectations best in terms of performance and possibilities. The financial deal seems very honest to us as well and the regular updates make it more efficient. Plus, it helps us always explore more possibilities. A big advantage for us was how easy it is for our artists (some of whom are graphic design grads), to support our developers by integrating the Blueprint bases to keep in mind the integration, resource management and many gameplay functions. We've been working in Unreal Engine 4 for 10 months now, and it's been a brilliant creative tool. 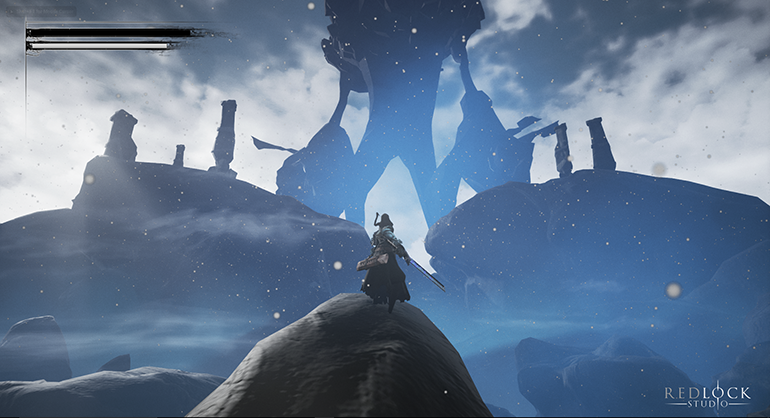 Q: Are there any aspects of Unreal Engine 4 that your team has found particularly useful throughout development? Max: The use of Blueprints by our artists has been a lifesaver. Also, the management of light, particles and the extremely open visual results (that we're only just starting to explore) were very appealing, and we haven't been disappointed. Q: What type of feedback have you received on the project and how are you incorporating that feedback to improve the final version of the game? Max: We've had the chance to share our work with established industry figures such as fellow Lyon-based developer Milen Ivanov (founder of Ryseup studios and former environment artist at Arkane), many streamers, journalists, our former teachers (such as Gilles Benoit or Phillipe Louvet of Bellecour Ecoles), and many others. These people helped us develop the visual results in Unreal, especially game design and the way we would mix elements such as 2.5D platforming and 3D boss fights, sidescrolling and free angle camera, and RPG elements like side quests, crafting, etc. We have always tried to accept constructive criticism and not take anything for granted and to know what we were good at (and what we weren't) in order to get to the best results we could while being certain of Shattered's potential and our capacity to bring it to completion. Q: You’ve recently launched a Kickstarter to offer fans the opportunity to support the project. Please tell our audience what you hope to achieve with the Kickstarter and how they can get involved. Max: We thought very early on about crowdfunding. According to our experience in the past few years, it was the best way to have a direct relationship with our future players and to go for our ideas fully without compromising, while trying to work with as much freedom as possible. We sincerely hope to offer something unique and make every one of our supporters proud of the result. We also want to prove that it is possible for a young and dynamic team to produce a quality game, manage resources efficiently and to deliver our best work. We want to convince a large public so that Shattered can be the first stone in a saga that in time develops a vast universe bringing together different time periods and styles, all the while working with evolving technologies and proposing ever more ambitious experiences. This can only truly make sense thanks to the community, and we're hoping to give people a variety of ways to really contribute and become a part of the adventure if they desire. Q: Thanks so much for your time! Beyond the Kickstarter, where can people go to learn more about Shattered: Tales of the Forgotten King and follow the project? Max: We've just launched a new website and you can find us on Facebook and both Twitter and Instagram (@RedlockStudio). And, even though we haven't talked much about it yet, we are also working on tabletop game and book projects, slightly different from Shattered but linked to its universe, as well as a RPG forum for the community to write their own story within the world we're building. A heartfelt thank you for your attention and questions - answering them was a real pleasure. See you on Kickstarter!